June 1st and 2nd our NAHCA CNA Leadership Team traveled to Des Moines for NAHCA’s annual “Key to Quality” national convention. Representing Sunrise Terrace Nursing & Rehabilitation Center was Angie Gibbs, Mellisa Bandy, and Amanda Wilke. Convention topics included Respecting and Protecting our Elders, Driving Quality from the Frontline, Restoring our Elders to their Fullest Potential, Recruiting and Retention, and The Way Ahead. Out of hundreds of CNA’s, Sunrise Terrace’s Amanda Wilke was the recipient of NAHCA’s Rookie of the Year award. This was a great honor. Later, to our surprise, Amanda also won an all-expense paid trip to next year’s convention in Washington, D.C.! 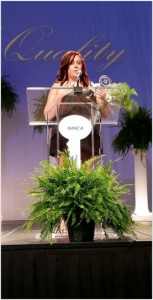 It was a wonderful evening and we are grateful for the opportunities NAHCA provides all of our CNA’s and the benefits they provide to our residents! Our CNA’s would also like to thank the community for the support they received while raising funds for national convention. Amanda Wilke accepts NAHCA’s Rookie of the Year award.